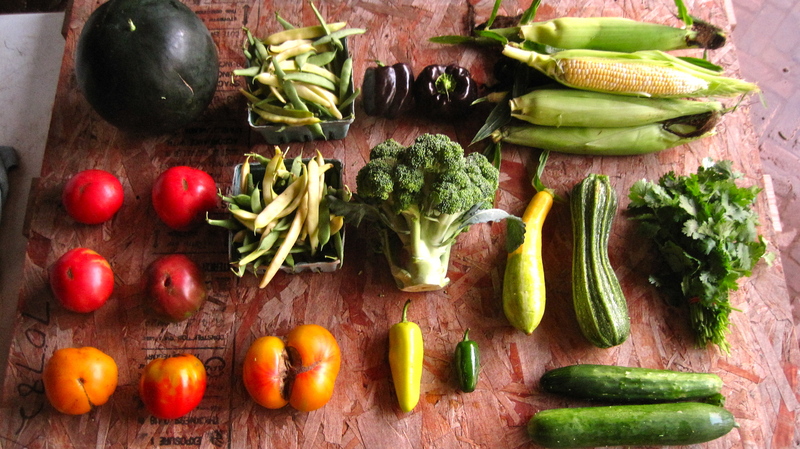 This box is a great illustration of what it really means to be a CSA member. We’ve waited patiently through the early spring boxes, with lovely little lettuces and crispy radishes and delicate herbs, and now we’re on to the best phase of the year: peak season! These are the boxes that illustrate just how important it is to remember that when you join any CSA, you are participating in the life of the farm for the entire season. 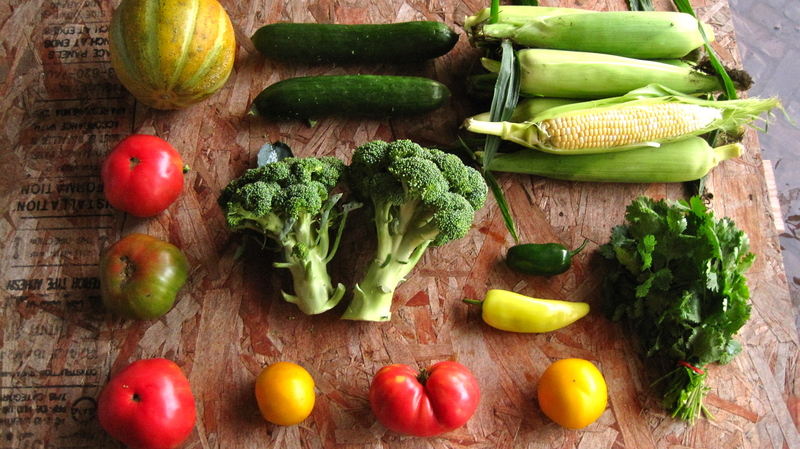 We all know what the weekly cost of a small, medium, or full share is, and while sometimes in the beginning of the season the boxes aren’t always “worth” that full amount if you were to buy the items organically at your local co-op, once we hit peak season your CSA boxes contain way more value in them than the weekly cost. All this is to illustrate that CSA members are special and unique because they have agreed to support a farm throughout the entire season, and understand that the value of their shares has to be evaluated over all 18 boxes. 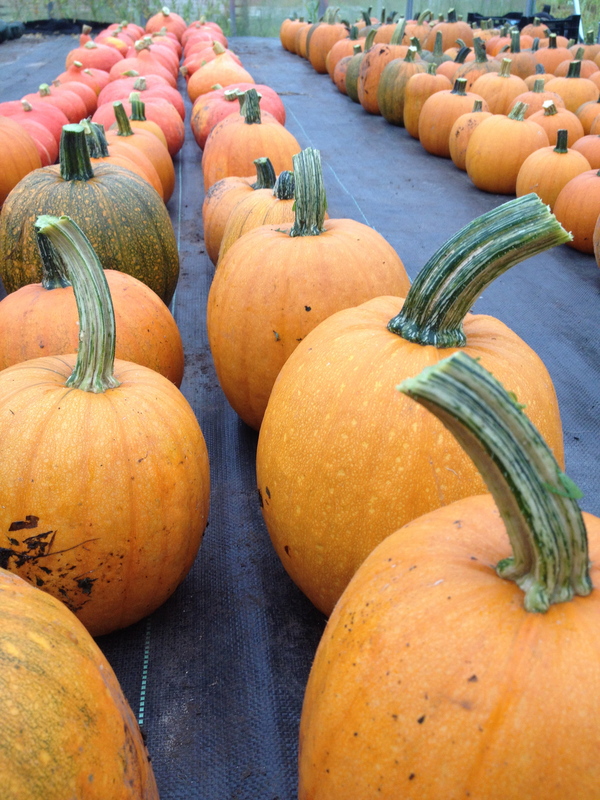 We spent an entire day last week salvaging what Kuri, Kabocha, and Pumpkin we could from one of our squash patches. Vine borers had killed all the plants, and began eating away at lots of the fruits, so even though it’s earlier than we would normally remove them from the fields we cut every last one off the vine, inspected them for damage, and brought the good ones into the greenhouse for safe keeping. Some vine borer damage in a Kabocha Sunshine winter squash. Gross. We probably lost at least half the crop in those families. The good thing is we plant squash in several areas of the farm, and plant a variety of families, some of which are less attractive to the little bugs. It is fun to see all of the squash we did get out of the attacked patch in nice rows in the greenhouse! Our good friend and neighbor, Bob Johnson. We think we found a pumpkin the size of the little baby-to-be! Here’s what’s in your overflowing boxes this week! 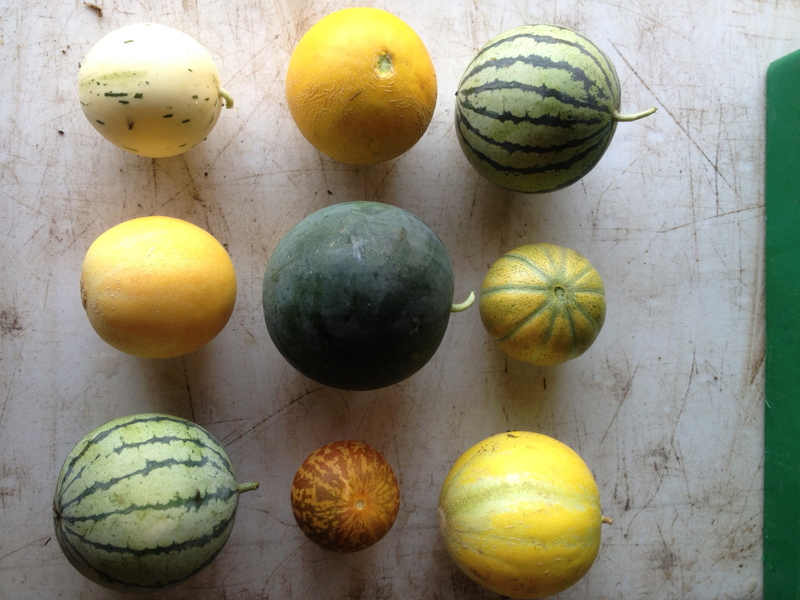 Melons–they are here! The crop is looking great, and the quality is pretty awesome this year! Store these on your countertop to begin with. Once they start to emit a sweet melon smell, if they aren’t already, eat them right away or pop them in the fridge to enjoy later. Cilantro-after a hiatus thanks to a lost succession due to rains, we have a lovely crop of cilantro ready for you. There’s so many things to do with it that we don’t even know where to begin. It’s great tossed into fresh salads, sprinkled on your breakfast taco, or made into a delightful chimichurri sauce or fresh salsa. Snap beans-the summer round of beans is also doing great! The plants are vigorous, healthy, and producing like crazy. 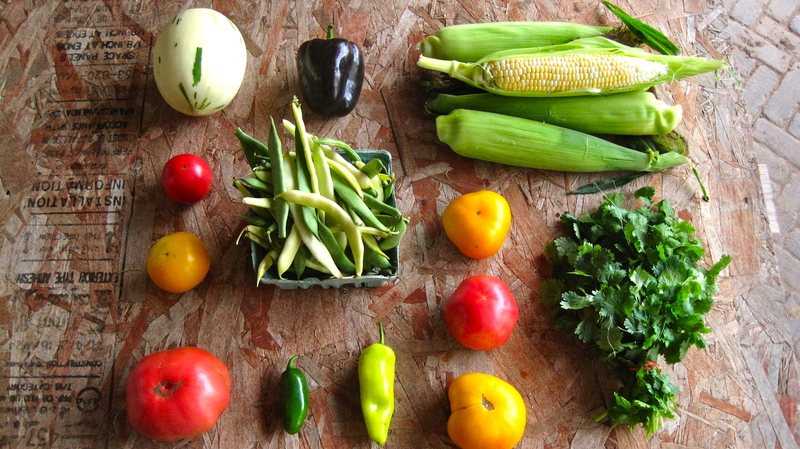 Your beans may be yellow, green, or a combination of both. They might also be the broader, flatter Romano style bean or perhaps the thinner French-style Haricots, all depending on what’s ready when we pick them on Monday or Wednesday. All of the bean recipes we give you will work just fine for any type of fresh snap bean. 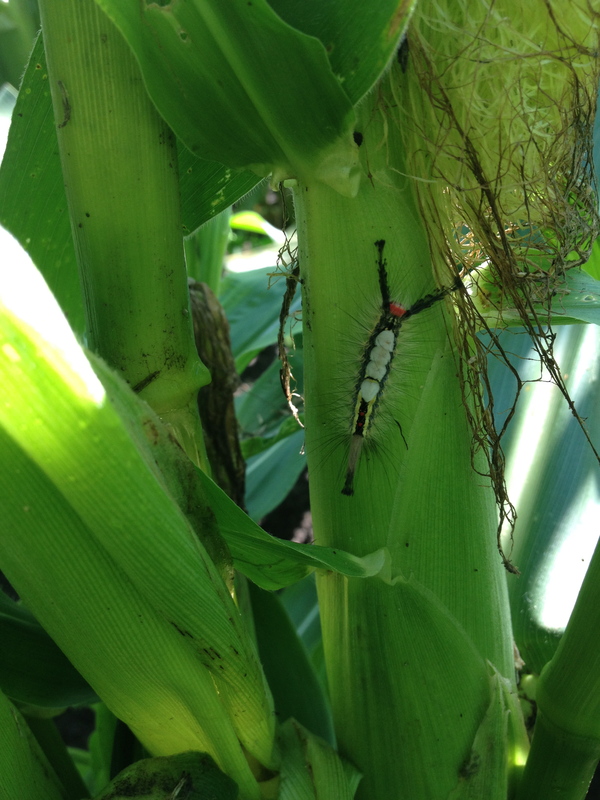 The coolest caterpillar ever, this little one will become a White-marked Tussock Moth. 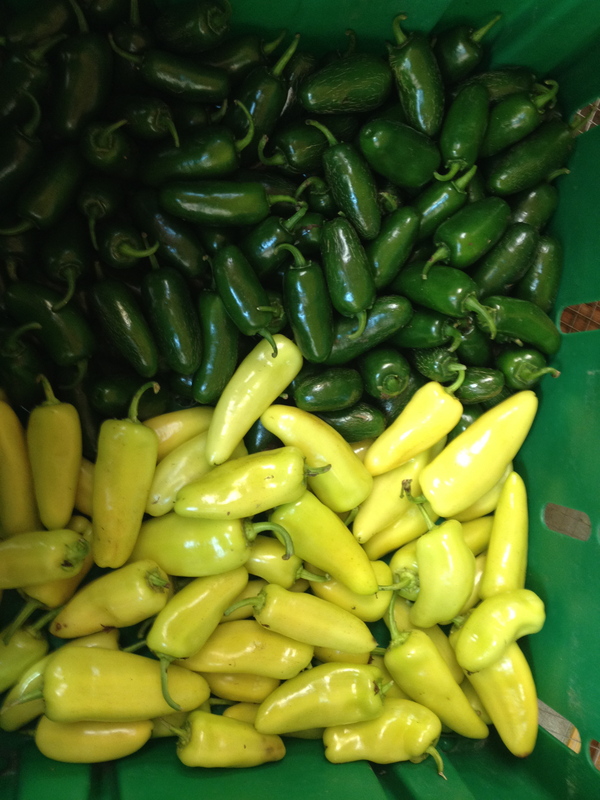 Hot pepper id: the dark green ones at the top of the photo are jalapenos, the bright yellow-green guys are hungarian hot wax. In a saucepan large enough to hold the beans, warm the olive oil over medium-low heat. Add the green onions and cook, stirring, until translucent, about 8 minutes. Add the tomatoes and chili, increase the heat to medium and simmer, stirring occasionally, until the tomatoes reduce slightly, about 10 minutes. Transfer the beans to a warmed serving dish and sprinkle with the parsley. Serve immediately. Serves 6. 1. Preheat broiler and set rack 4 inches below. If your broiler and oven are separate, also preheat the oven to 425 degrees. Line 2 baking sheets with foil. 2. Place tomatoes and jalapeños on one of the baking sheets and set under broiler, about 4 inches from heat. Broil for about 6 minutes, until skins are charred and blackened in spots. Using tongs, flip over tomatoes and jalapeño and continue to broil for another 6 minutes. The tomatoes and chiles should be softened and cooked through as well as charred. Tip tomatoes and chiles, along with any juices in the pan, into a bowl and allow to cool. 3. Place corn on baking sheet and set under the broiler. Broil until you hear the kernels beginning to pop, 2 to 4 minutes. Corn should be nicely browned on one side. Flip over and broil for 2 minutes, or until you hear popping, on the other side. Remove from heat, allow to cool, then cut kernels from cob and set aside. 4. If using the same oven to roast the onions, turn heat down to 425 degrees. Break up onions into rings and place on baking sheet in a single layer. Add garlic and place in oven. Roast, stirring every 5 minutes, until onions have softened and are lightly browned and charred on edges and garlic is soft and browned in spots, about 15 minutes. If some of the smaller pieces of onion begin to char more quickly than others, remove them sooner. 5. Stem jalapeños and place with onions and garlic in a food processor fitted with a steel blade. Pulse until mix is finely chopped. Scrape down the sides of the bowl as necessary. Transfer to a large bowl. 6. When tomatoes are cool enough to handle, core and discard skins (hold over bowl to catch juices). Place in food processor with juice and pulse to a coarse purée. Add to bowl with chopped onions, garlic and jalapeño. Add the vinegar, season generously with salt (Rick Bayless recommends a generous teaspoon), and stir in the cilantro and corn. If desired, thin out with water. Advance preparation: This will keep for 5 days in the refrigerator and can be frozen for up to a month.